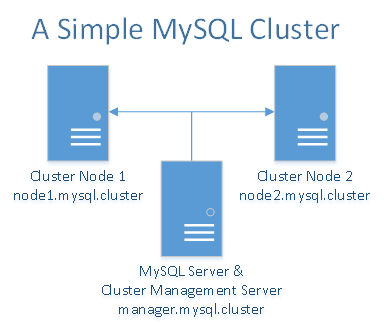 MySQL cluster is a software technology which provides high availability and throughput. If you are already familiar with other cluster technologies, you will find MySQL cluster similar to them. In short, there is one or more management nodes which control the data nodes (where data is stored). After consulting with the management node, clients (MySQL clients, servers, or native APIs) connect directly to the data nodes. You may wonder how MySQL replication is related to MySQL cluster. With the cluster there is no typical replication of data, but instead there is synchronization of the data nodes. For this purpose a special data engine must be used — NDBCluster (NDB). Think of the cluster as a single logical MySQL environment with redundant components. Thus, a MySQL cluster can participate in replication with other MySQL clusters. MySQL cluster works best in a shared-nothing environment. Ideally, no two components should share the same hardware. For simplicity, and demonstration purposes, we'll limit ourselves to using only three Droplets. There will be two Droplets acting as data nodes which are syncing data between themselves. The third Droplet will be used for the cluster manager and at the same time for the MySQL server/client. If you have more Droplets, you can add more data nodes, separate the cluster manager from the MySQL server/client, and even add more Droplets as cluster managers and MySQL servers/clients. You will need a total of three Droplets — one Droplet for the MySQL cluster manager and the MySQL server/client and two Droplets for the redundant MySQL data nodes. MySQL cluster stores a lot of information in RAM. Each Droplet should have at least 1GB of RAM. Please replace the highlighted IPs with the private IPs of your Droplets correspondingly. Except otherwise noted, all of the commands that require root privileges in this tutorial should be run as a non-root user with sudo privileges. You can download the free, Generally Available (GA) MySQL cluster release from the official MySQL cluster download page. From this page, choose the Debian Linux platform package, which is also suitable for Ubuntu. Also make sure to select the 32-bit or the 64-bit version depending on the architecture of your Droplets. Upload the installation package to each of your Droplets. The installation instructions will be the same for all Droplets, so complete these steps on all 3 Droplets. Now you can find the MySQL cluster installation in the directory /opt/mysql/server-5.6/. We'll be working especially with the bin directory (/opt/mysql/server-5.6/bin/) where all the binaries are. The same installation steps should be performed on all three Droplets regardless of the fact that each will have different function — manager or data node. Next, we will configure the MySQL cluster manager on each Droplet. In this step we'll configure the MySQL cluster manager (manager.mysql.cluster). Its proper configuration will ensure correct synchronization and load distribution among the data nodes. All commands should be executed on Droplet manager.mysql.cluster. The cluster manager is the first component which has to be started in any cluster. It needs a configuration file which is passed as an argument to its binary file. For convenience, we'll use the file /var/lib/mysql-cluster/config.ini for its configuration. For each of the above components we have defined a hostname parameter. This is an important security measure because only the specified hostname will be allowed to connect to the manager and participate in the cluster as per their designated role. Furthermore, the hostname parameters specify on which interface the service will run. This matters, and is important for security, because in our case the above hostnames point to private IPs which we have specified in the /etc/hosts files. Thus, you cannot access any of the above services from outside of the private network. In the above file you can add more redundant components such as data nodes (ndbd) or MySQL servers (mysqld) by just defining additional instances in the exactly the same manner. The cluster manager does not have to run all the time. It can be started, stopped, and restarted without downtime for the cluster. It is required only during the initial startup of the cluster nodes and the MySQL server/client. Next we'll configure the data nodes (node1.mysql.cluster and node2.mysql.cluster) to store the data files and support properly the NDB engine. All commands should be executed on both nodes. You can start first with node1.mysql.cluster and then repeat exactly the same steps on node2.mysql.cluster. Once you are finished with the first node, repeat exactly the same steps on the other node , which is node2.mysql.cluster in our example. A standard MySQL server, such as the one that is available in Ubuntu's default apt repository, does not support the MySQL cluster engine NDB. That's why you need a custom MySQL server installation. The cluster package which we already installed on the three Droplets comes with a MySQL server and a client too. As already mentioned, we'll use the MySQL server and client on the management node (manager.mysql.cluster). To exit the MySQL prompt, simply type quit or press simultaneously CTRL-D. The above is the first check to show that the MySQL cluster, server, and client are working. Next we'll go through more detailed tests to confirm the cluster is working properly. To exit the management console type quit. The management console is very powerful and gives you many other options for managing the cluster and its data, including creating an online backup. For more information check the official documentation. Let's have a test with the MySQL client now. From the same Droplet, start the client with the mysql command for the MySQL root user. Please recall that we have created a symlink to it earlier. The most important information from above is the number of ready nodes — 2. This redundancy will allow your MySQL cluster to continue operating even if one of the data nodes fails while. At the same time your SQL queries will be load balanced to the two nodes. You can try shutting down one of the data nodes in order to test the cluster stability. The simplest thing would be just to restart the whole Droplet in order to have a full test of the recovery process. You will see the value of number_of_ready_data_nodes change to 1 and back to 2 again as the node is restarted. To see how the cluster really works, let's create a new table with the NDB engine and insert some data into it. Please note that in order to use the cluster functionality, the engine must be NDB. If you use InnoDB (default) or any other engine other than NDB, you will not make use of the cluster. When you are inserting and selecting data like this, you are load-balancing your queries between all the available data node, which are two in our example. With this scaling out you benefit both in terms of stability and performance. As we have seen in this article, setting up a MySQL cluster can be simple and easy. Of course, there are many more advanced options and features which are worth mastering before bringing the cluster to your production environment. As always, make sure to have an adequate testing process because some problems could be very hard to solve later. For more information and further reading please go to the official documentation for MySQL cluster.